The cost of entry for virtual reality hardware has plummeted in the few short months since the launch of the Oculus Rift and HTC Vive in May. Here's the crazy virtual reality demo I did live on stage at Oculus Connect today. The idea is that virtual reality puts people first. It's all about who you're with. Once you're in there, you can do anything you want together -- travel to Mars, play games, fight with swords, watch movies or teleport home to see your family. You have an environment where you can experience anything. 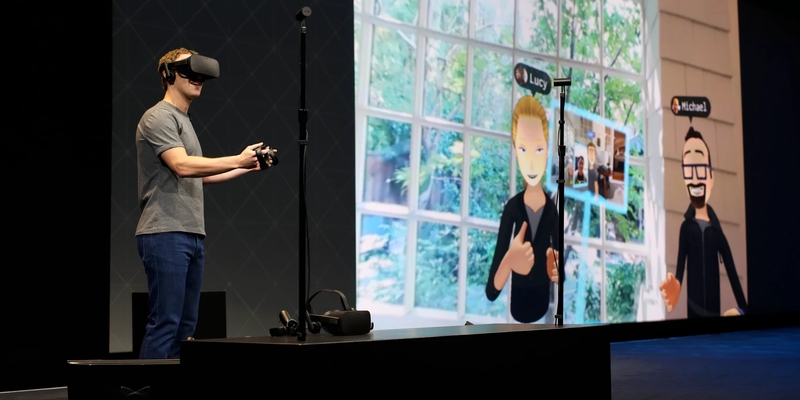 Yesterday, Zuckerberg reprised his appearance at Oculus Connect. This time, though, the only thing that felt like last year was the gray t-shirt he wore. For starters, there were 2,500 developers in attendance, more than double last year’s turnout. Most importantly, though, Zuckerberg slipped on a Rift headset to demonstrate what a Facebook social experience might look like in VR—and in doing so, he made clear that virtual reality’s success wouldn’t hinge on games, or movies, or concerts. It would hinge on other people. Those are issues for another day, though. For now, the Santa Cruz experience convinced me that, with a little more work, wireless head-tracking is a problem that will be solved in the near future. As mobile processors continue to improve, we'll soon be at the point where a completely wireless headset can provide "good enough" virtual reality complete with convincing tracking driven by internal cameras. Just don't expect it to ever fully match the raw visual quality of a high-end, tethered VR experience. For Booth, whose 20-year background in video game includes stints at Valve and Blizzard, unlocking the social side of VR is a subversion of everything he’s used to. “In the video game industry, we focused all of our energy on ‘we’re gonna create an experience for you,'” he says. “This is turning that completely around. It’s all about putting people first—connecting with your friends. I think we’re getting pretty close to that.” But for now, there are selfies.